Roberto Poli is an Italian pianist born in Venice, Italy in 1972. Student of the legendary pianist Russell Sherman at the most prestigious New England Conservatory in Boston, USA, Roberto is today an international performer, the artist in Residence and chair of the piano department at the Rivers School Conservatory (Weston, MA – USA), faculty at the Preparatory School of New England Conservatory, respected communicator on the music of Frederic Chopin, and author of the acclaimed book The Secret Life of Musical Notation: Defying interpretive traditions. 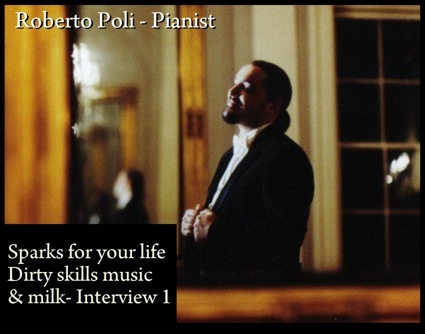 Roberto Poli is what one would call a passionate artist who not only knows how to play, but also knows how to communicate his love for the classical music repertoire. Despite his impressive résumé, luckily Roberto is also a humble, funny and sweet person I love hanging with. During his trip to Paris, where he was conducting research and preparing material for his second book on Frédéric Chopin, I had a chance to sit with him, drink a few glasses of Chabli, and have a chat! Do you remember wanting to be a pianist as a child? Yes. I was nine years old, and did not know what playing the piano meant. But my mother had some K7 tapes of Beethoven’s piano Sonatas and other classical pieces, and for some reason I was so attracted to the magic of the music that I wanted to be part of it. I asked my parents, who did not own a piano, whether I could learn how to play. Three years later, understanding that I wasn’t ready to let go, they decided to rent a piano. I have a happy, fulfilling life. It is mostly when I make music and talk about it that I feel very much in the flow: time becomes immaterial, and I live in the moment. It is something elusive – something that I manage to achieve only when involved in music. My life is not only about making music, of course, but it is so entrenched in it that I derive pleasure from much of what I do. Which one?? (laughs) I have many interests, and there are several sides to my activity. I am a performer, and have the fortune to play around the world. But I also love teaching, and feel that I learn from it more than when I try to work things out on my own. It is as if I saw myself from outside and solved my own problems, still of course knowing that being part of the learning process of a student is the most touching and interesting part of the process. Sometimes I feel as if I should be the one to have to pay for that! I am also a writer: I write about music – something I began five years ago. I got very involved in it, and feel very much in the flow when I write. It gives me great pleasure. I am now writing a second book, mostly devoted to Chopin. It is something both autobiographical and scholarly. How would you describe the lifestyle of your profession today? A lot of my life revolves around the piano: I practice and learn new music I have to perform; and as a teacher, I am physically by and at the piano. Traveling is also an important perk in my profession. It is nice to see new places, return to the ones I have already been to; meeting people and begin new friendships… It is something I value greatly. There is also the collaborative aspect of playing the piano: some of the repertoire I play with other people offers of new level of sharing and interaction, which is an important part of my work. But in the end, I like to also think that after all this, I need my space. I like to spend time on my own, which is crucial to me both as a person and as an artist – to regenerate and find new inspiration. What are the clichés of a classical piano player? When did your love for Frederic Chopin’s music started? I think it was always there: yes, there was Beethoven at the beginning, because of my mother’s tapes. But there was also Chopin early on. I think I was about fourteen when I started to collect K7 tapes of his music. In retrospect they weren’t the best recordings, but there was in the music itself something that I found more intriguing than in other composers. To this day I am not sure I would be able to explain, but a strong connection was made. Would it be fair to say that this love for Chopin is related to the fact that Chopin, exceptional piano player himself, mainly composed for the piano; and that as a pianist you dug deeper into the work of a composer who wrote mainly for your own instrument? Not completely. I’ve always been attracted to many other genres, such as the string-quartet repertoire, orchestral music, opera. I don’t think it was necessarily related to the fact that the piano was my vehicle of expression. There was something in his music that I have always found magnetic. In the simplest possible way, would you point out one or two things you find amazing about Frederic Chopin’s music? There is something about both his life and his music that is mysterious. For instance, Chopin was described as being “without a heart” by a friend of George Sand. And when you read his letters, there is something about the way he communicated that was a little detached. He wasn’t particularly warm, expressive, emotional. For him writing was, as for most of the world at that time, a necessity of communication; and he viewed social interactions as necessary in the world in which he gravitated. But even though in his letters rarely transpired warmth, yet there is so much in his music that is profoundly emotional, passionate – I would even say narcotic. It is a very difficult question, but I guess the fact that he would not give much of himself to others, or that he was not particularly good at expressing himself in words and still did that so well through his music is something I find very compelling. I should add that the music of Chopin that is actually known to the public is a small portion of his work. If you go beyond the most accessible pieces, you end up discovering a different composer. It was during the time he met the French writer George Sand, who was his lover and a fundamental presence of his life, that Chopin deepened his knowledge of counterpoint and studied the Well-tempered Clavier of Johann Sebastian Bach. He studied two important treatises by Cherubini (Italian composer) and one by Kastner (French theorist). He was 30 years old, and for the next seven years he developed a language that parted from his earlier experimentation (he died at age 39, but stopped writing two years before his death). Chopin had always been adventurous, but dealing with counterpoint brought him to develop a language that was found disturbing by many. Most of his late works were not understood or even acknowledged as important contributions to the history of music before the twentieth century. I find it extraordinary that in such a short amount of time he managed to transform his language to such an extreme. Many composers of the second half of the nineteenth century were drawn to Chopin: his music served as a model for composers such a Debussy, Ravel, Fauré and Scriabin. What is the relationship between the history of interpretation and the way people play today? With the blossoming of the recording industry, we have developed the ability to listen to as many recordings as we wish, and take them as models and be influenced by them. When listening to the recordings of the pianists who grew up in the nineteenth century, you hear a voice in each one of them that is not quite there today. We have certainly witnessed globalization in music making, and I think we have lost something. It is unfair to generalize about how musicians experience music as a phenomenon. But today we have so many recordings, sometimes dozens of recordings of the same piece! It’s great that we do, don’t get me wrong; but I wonder how it affects us as artists. Is the life of Chopin itself interesting or relevant to understand his music? Of course it is interesting, though I am not quite sure whether it is relevant to understand his music. Perhaps we can relate to certain periods of his life and see how the music he wrote in a specific period reflects a particular state of mind. It is perhaps important to remember that he did not want his music to be understood through images. He disliked programmatic music, and never revealed the content of a piece and his original inspiration. Whatever the performer communicated through music, for Chopin it had to be done through intuition and creativity. One last question, Roberto, before we go to dinner: over the last ten years, you have produced an impressive body of work in term of recordings of Chopin’s music. Listening to it, I wondered if to you there was a way to summarize the work of Chopin in its nature or direction. A way to summarize it is to look at the contribution that Chopin made both to music and to piano playing. Chopin was self-taught as a pianist – a fact that has always amazed me. Even though he was offered by Friedrich Kalkbrenner to study with him when he arrived in Paris in 1831 (he was considered one of the greatest pianists and pedagogues in the French capital in the early nineteenth century), Chopin refused on the grounds that it would have compromised his art. He realized that the common training to which pianists submitted themselves would have prevented him from building a totally new language that would be far from the preconceived notions of musical education. In fact, during the few years that he spent composing (there were eighteen years or so of his life in which he actively composed), there is an evolution that aimed to expanding his world and destroy traditions. Even though his existence might be considered quiet and removed, Chopin was an iconoclast. And despite his inability, or unwillingness, to be warm and communicative, he knew that there was so much to say with music.